After we returned from Chicago I was still dreaming about the tortilla soup Patrick had at Topolobampo (you can read the full post here about our trip). I figured that it must have taken days to make and a crazy amount of ingredients, like a Mexican mole. Mexican food can actually be quite complicated if you cook traditional recipes as they use layers and layers of flavors. 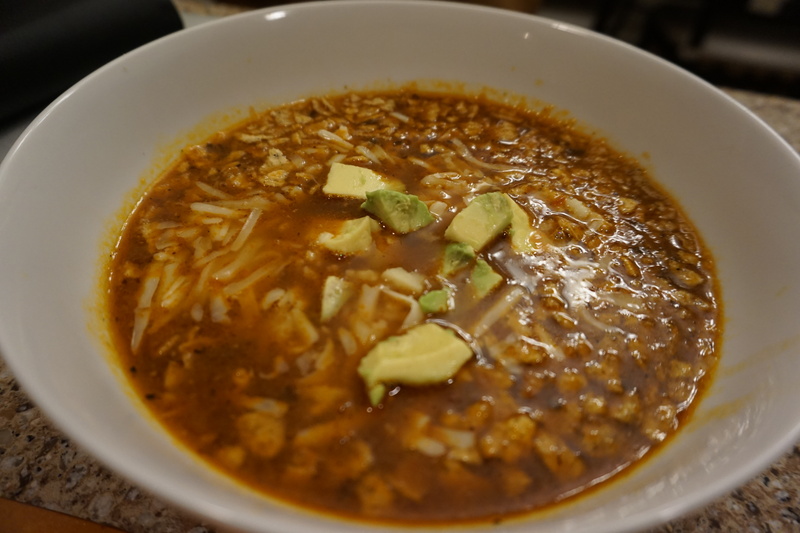 I was so happy to discover that not only did Rick Bayless put this recipe up on his website but that it was really simple! I can never leave well enough alone so I make some tweaks of my own – keeping the pasilla chile seeds in adds a nice little kick – and by using rotisserie chicken breasts I simplified it even more. As you can see from the picture it’s not the prettiest meal but it is so hearty and satisfying – the perfect upgrade for chicken noodle soup if a loved one was sick. If you wanted to class it up a bit you could add the broth tableside like they did at Topolobampo. One negative about this soup – it’s not great made ahead of time. I made the full recipe that serves 4 for Patrick and I one night for dinner. I saved the left over broth for the next day but it was almost inedible it was so salty and strong. Soups are usually great to freeze and make ahead but I think this one is just too flavorful – its best eaten day of. Happy fiesta friday! First you want to toast the pasilla chile. If you have a gas stove you can do it directly over the flame (much like making rajas). 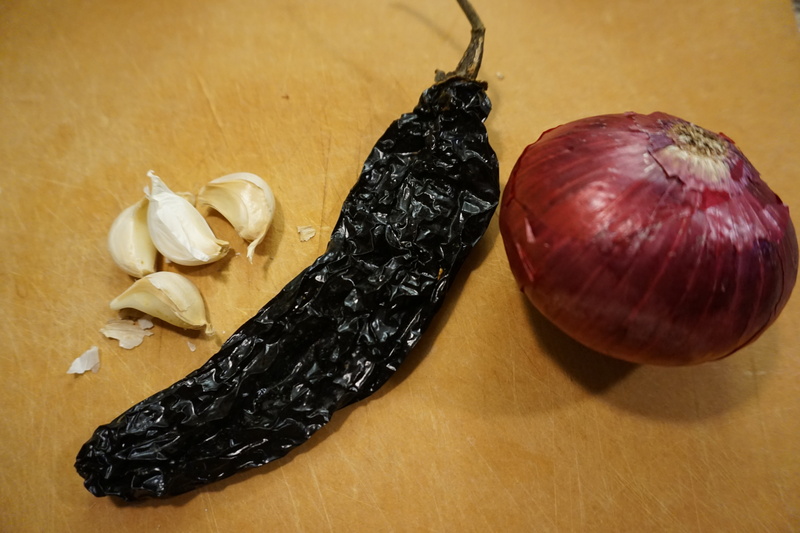 Basically you want to see the color darken a bit and to be able to smell the chile. If you have an electric stove just heat a skillet over high heat and add the chili for 30 seconds or so until you get the same smell/color change. Put the chili or chilis into a blender or food processor. I leave in the seeds for some heat but if you want to remove them do so now. The tomatoes will soften the pasilla while you cook the onions. In a large saucepan or dutch oven heat the oil over medium high heat. Cook the onion for 5 minutes or so until starting to soften, add the garlic and cook for a minute more being careful not to burn it. Using a slotted spoon transfer the onion and garlic to the blender/food processor and blend until smooth. Using the same pan over medium high heat cook the tomato, onion and pasilla puree for 6 or 7 minutes. Make sure to keep stirring it so the bottom doesn’t burn – you want most of the liquid from the tomatoes to cook out. Then add the broth and reconstitute the tomato mixture – this is easiest to do with a wisk. Add the sprig of oregano or dried oregano. Raise the heat to bring it to a boil and then lower the heat to low and let it simmer for 15 minutes. Season with salt. Stir in the shredded chicken and let it cook with the broth for a minute to heat through. To serve equally divide the cheese and tortilla chips at the bottom of the bowls. Laddle the soup on top and then add the avocado on top. First you want to toast the pasilla chile. 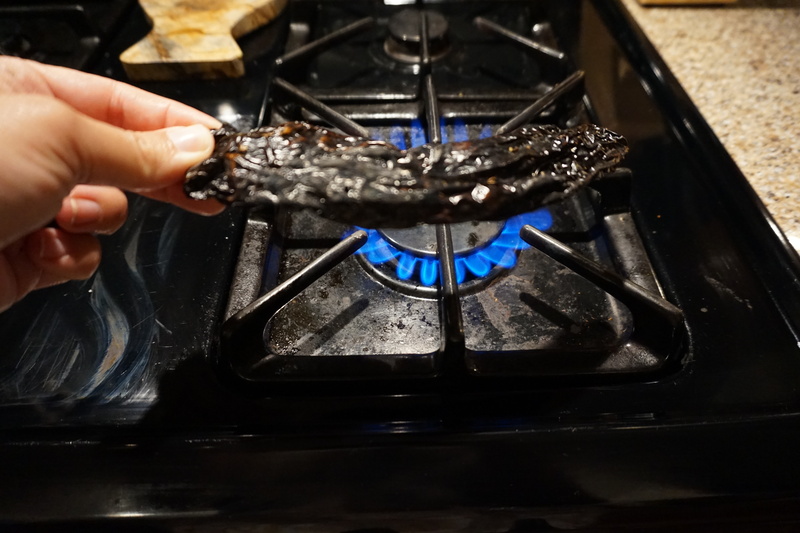 If you have a gas stove you can do it directly over the flame (much like making rajas). Basically you want to see the color darken a bit and to be able to smell the chile. If you have an electric stove just heat a skillet over high heat and add the chili for 30 seconds or so until you get the same smell/color change. Put the chili or chilis into a blender or food processor. I leave in the seeds for some heat but if you want to remove them do so now. The tomatoes will soften the pasilla while you cook the onions. In a large saucepan or dutch oven heat the oil over medium high heat. Cook the onion for 5 minutes or so until starting to soften, add the garlic and cook for a minute more being careful not to burn it. Using a slotted spoon transfer the onion and garlic to the blender/food processor and blend until smooth. Using the same pan over medium high heat cook the tomato, onion and pasilla puree for 6 or 7 minutes. 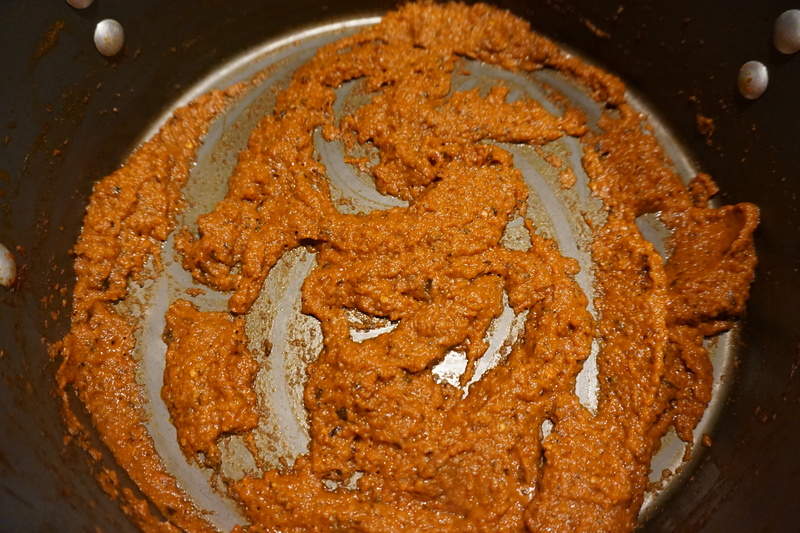 Make sure to keep stirring it so the bottom doesn’t burn – you want most of the liquid from the tomatoes to cook out. Then add the broth and reconstitute the tomato mixture – this is easiest to do with a wisk. Add the sprig of oregano or dried oregano. Raise the heat to bring it to a boil and then lower the heat to low and let it simmer for 15 minutes. Season with salt. Stir in the shredded chicken and let it cook with the broth for a minute to heat through. To serve equally divide the cheese and tortilla chips at the bottom of the bowls. Laddle the soup on top and then add the avocado on top. Thank you. I had tortilla soup last week at the Whitney Museum and remembered how much I loved it in Mexico. This recipe looks easy enough that I will be making it soon. By the way the potato salad with arugula pesto was a big hit with guests last weekend.